Thanks Mr. Unreadable sign, now i'm not lost. For those wondering: Handwritten is north-east italian dialect and sounds like "FOLLOW THE PATH FFS"
According to the Japanese part, it's a bushwalking course. But we're still lost. could of gotten lost if it werent for this sign.thank god. The chinese and japanese makes sense too, just the engrish is wrong. 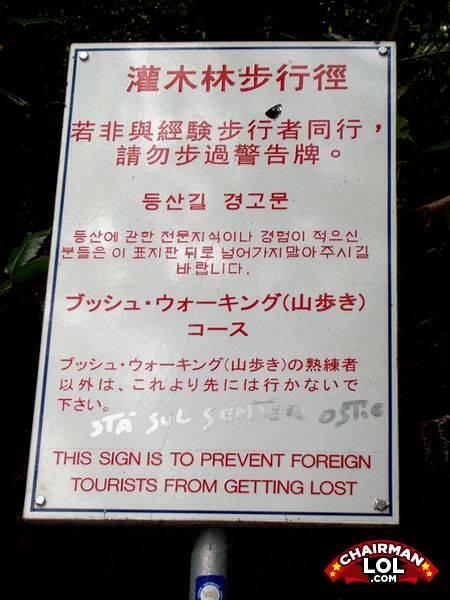 The sign says "If you're not accompanied by an experience jogger, please don't go past this sign"
By "FOREIGN" we mean anyone who can read Japanese, Korean, and Chinese.